Punch will be served at the free mini-festival. As you may recall (quite possibly with glee), Richard Spencer got punched in the face in Washington D.C. shortly after Donald Trump’s sparsely attended inauguration. Video of said thrashing instantly went viral, both in its original form and the inevitable remixes. 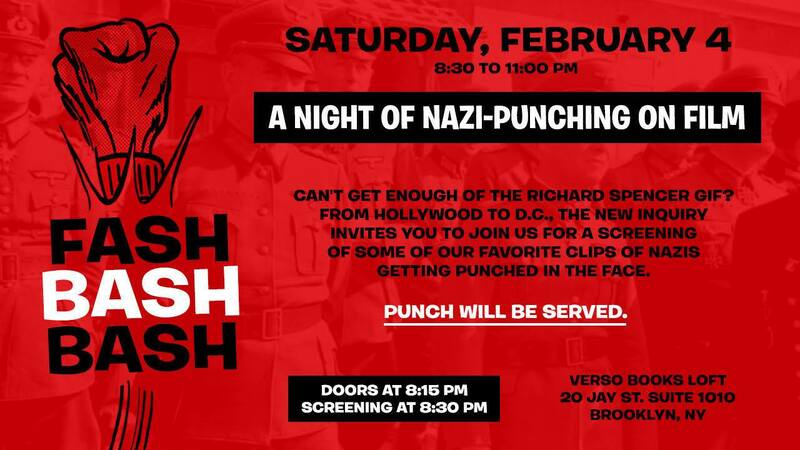 Said footage is certain to be part of this Saturday’s Fash Bash Bash: A Night of Nazi-Punching on Film, a free mini-festival in New York organized by the New Inquiry — and yes, punch will be served. The cinematic celebration is slated to last some 90 minutes and feature clips from well-known films in the vein of “Inglourious Basterds” alongside more obscure fare as well. More information may be found here.